Enjoying the nut-like flavor of Sunrise Farms naturally-aged yogurt might make you forget that this premium delight provides 15% of the protein and 20% of the calcium that you need each day in a single eight-ounce serving…not to mention the health benefits of yogurt with its live and active cultures! 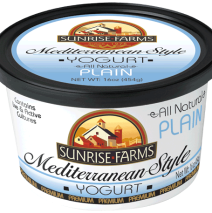 Thicker than other yogurts, the full-body and smooth texture of Sunrise Farms premium yogurt is created by our all-natural ingredients and traditional Mediterranean processing method. Natural flavors in our Sunrise Farms vanilla yogurt make it a wonderful “anytime” treat – it’s a great substitute for ice cream…just don’t tell the kids it’s healthy! A faint zest to our plain yogurt makes it delicious by itself or perfect for cooking (add a drop of milk to create a healthy substitute for sour cream!). Ingredients: Pasteurized grade A milk, cream, non-fat milk, carageenan, live active cultures.